(A500L) Large T-box - Designed and manufactured at the feather farm with 25 years breeding experience. This box comes fully assembled and ready to mount to the cage, includes an inspection door on the back for viewing and pulling babies. 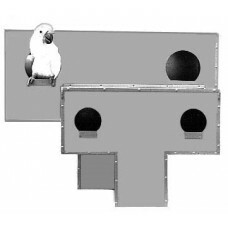 The Cockatoo box is designed to help minimize aggressive breeding behavior as the baffle and second entry door prevent male from trapping the female in the box and also helps eliminate light in the nesting chamber for additional security.